Meanwhile, Japan’s Ministry of Defense has published its own analysis on China’s South China Sea building activities. 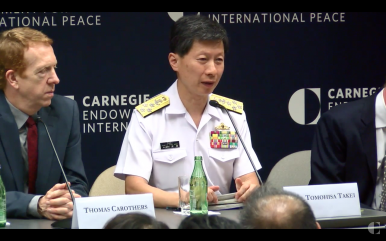 Should China use the artificial islands it has built for military purposes, all of the South China Sea could be “covered by China’s sphere of military influence,” the commander of Japan’s Maritime Self-Defense Forces (JMSDF), Admiral Tomohisa Takei, warned in a speech delivered this Wednesday at the Carnegie Endowment for International Peace in Washington. While calling for increased maritime cooperation in the region, Takei emphasized that problems between countries must be solved by peaceful means, international law and norms. “If one country ignores this and imposes its own interpretation of international law on its neighboring countries, freedom of navigation which is indispensable for an ocean of prosperity is threatened and unexpected incident at sea can occur as a result,” he added. Even though the Indian Ocean and the Western Pacific are geographically separated, they are so closely related that they cannot be separated both politically and economically. Therefore, we need to regard security in each of these two oceans as identical. Addressing the burgeoning regional military buildup, Takei also noted that “flawed transparency” is causing “stress and anxiety” between neighboring states. Interestingly, the same day Admiral Takei delivered his speech in Washington, Japan’s Ministry of Defense also published a short analysis of China’s building activities in the South China Sea on its website sketching out the military consequences of constructing artificial islands. “Building port facilities of certain size capable of berthing, resupply and maintenance would enable China to maintain more robust naval and maritime law enforcement presence in the entire SCS [South China Sea],” the presentation states. possible declaration of an “SCS Air Defense Identification Zone”. “Sustained deployment of various platforms including naval and law enforcement ships as well as aircraft enabled by military base construction would dramatically improve China’s ISR [intelligence, surveillance, and reconnaissance] and other mission capabilities in the central and southern portions of the SCS,” the defense ministry’s power point presentation further elaborates. South China Sea: China Is Building on the Paracels As WellChina, ASEAN Come to Agreement on a Framework South China Sea Code of ConductSouth China Sea: Is China Considering Construction Work at Scarborough Shoal Again?South China Sea: China Continues Construction Work on North Island in Paracel GroupExpect a Heavier US Presence in the South China Sea, But What Can It Achieve?